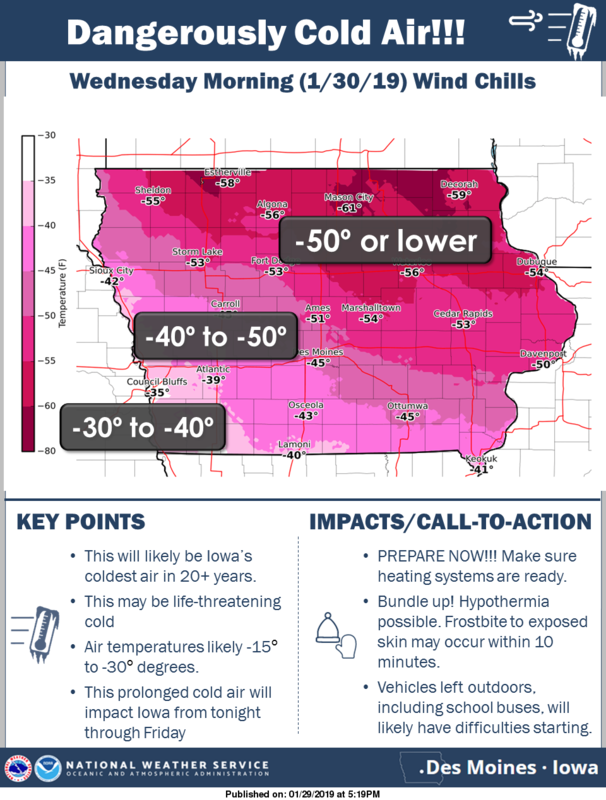 A complete focus on climate change this week, starting with a short video by the inspirational Greta Thunberg and finishing with a map of distinctly chilly Iowa. In between, articles about last year’s game-changing IPCC report on warming of 1.5oC, Germany’s plans to exit coal fired power, sweltering Adelaide and a report on feeding the world’s growing population. Greta Thunberg, the straight-talking Swedish teenager, has shot to attention worldwide with her passionate, well informed criticisms of the world’s failure to adequately tackle climate change. This is her six minute talk, ‘Our house is on fire’, at the World Economic Forum in Davos in January 2019. Greta doesn’t want adults to be hopeful; she wants us to feel her fear, she wants us to panic, she wants us to act ‘as if the house was on fire, because it is’. In October 2018 the Intergovernmental Panel on Climate Change (IPCC) released a special report on the social and environmental impacts of global warming of 1.5oC (warming of 2oC has been the internationally agreed upper limit of warming for the last decade or so). In my view, this is the most significant climate change report to appear in the last few years and certainly suggests that our house is already on fire. The full report is 800 pages but there is a very readable 33 page summary for policy makers. Even more accessible is ’37 things you need to know about 1.5oC global warming’. I encourage everyone to read it. Germany has been a leader in promoting international action to respond to climate change, even being a member of the High Achieving Coalition, and yet a laggard in terms of reducing its own dependence on coal. A government-appointed commission, which included environmentalists, has now released a plan for Germany to close all its coal fired power stations by 2038 at the latest, with a rapid start of 12GW (almost 30% of Germany’s coal powered electricity) closing down by 2022. The plan seems to have been well received by the government but climate activists are somewhat divided, some seeing it as a move in the right direction that can be built on while others think the close down is too slow, certainly too slow to avoid 1.5oC of global warming. Closer to home, Adelaide’s record temperatures in late January were bad news for fruit bats and egg-laying chickens, and the bad news isn’t only for the unfortunate bats and hens. These two examples of the consequences of heat are also indicative of the problems humans will increasingly experience as the world warms. Higher average and extreme temperatures threaten food supplies, in this case eggs, and forest regeneration and growth: ‘[Bats] disperse the seeds, and also pollen which creates new tree growth, new forest growth. Basically without the flying foxes helping to spread everything we won’t have trees’. Feeding the world’s population, which is predicted to increase to 9 or 10 billion in the next few decades, with a diet that is both environmentally sustainable and healthy was the topic of a recent report by a commission established by the highly regarded medical journal The Lancet and EAT (‘a global, non-profit startup dedicated to transforming our global food system’). Not surprisingly, powerful threatened interests rapidly responded negatively to the commission’s recommendations. In this Croakey article, Rosemary Stanton provides an explanation of the report’s findings and a spirited defence of them. While much of Australia is currently experiencing prolonged high temperatures, many in the USA are enduring life-threatening extremely cold weather. 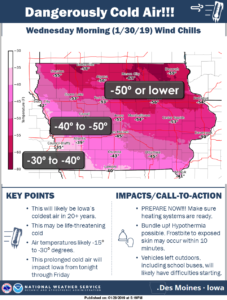 The map below of Iowa indicates temperatures, including wind chill, as low as -61oF (-52oC) a few days ago. Trump no doubt considers this to be proof that global warming is fake-news but it all fits with global warming. The cold weather is due to warming-induced disruptions to the polar vortex wind currents allowing very cold Arctic air to move further south than usual. The massive cavernous melt hole in the Thwaites glacier is a ‘good one’. No that is not the sky falling but…. At least when Mar a Lago disappears under water, preferably with the Orange freak in it, Americans will have proof positive of the global warming that the majority of citizens now acknowledge but the ruling elite still cannot.